With millions upon millions of Christmas lights in Gatlinburg and Pigeon Forge and throughout the area, what are some of the best ways to see them? You can choose to drive yourself around town, take a scenic aerial tram or mountain coaster ride, or take advantage of local holiday transportation and travel by trolley. Here are the best ways to immerse yourself in the holiday spirit and join other revelers for Christmas fun and festivities. Gatlinburg and Pigeon Forge are winter wonderland destinations and both cities will be lighting up the night sky during the holiday season with festive displays and many millions of lights – often animated or synchronized to music – in celebration of Christmas. Each city has scheduled events running from November through January and February. Through January 31, sit back and enjoy the Gatlinburg Winter Magic landscape ablaze with Christmas lights from the comfort of the heated and enclosed Gatlinburg Trolley. Take the Trolley Ride of Lights through downtown Parkway and the River Road area at 6:30, 7:30 or 8:30 p.m. This is an easy way to gaze at the thousands of illuminated displays featuring LED lighting in the colors of Christmas. The displays are custom designed to depict several themes including forest landscapes, magnificent evergreen trees, snowmen, a rocking horse and fountains. Animal displays are a tradition and you’ll see many that call the Great Smoky Mountains National Park home including deer, rabbits, foxes and squirrels. Admission is $5.00 for the trolley ride. On Friday, December 2, at 7:30 pm downtown Gatlinburg comes alive with the 41st Annual Fantasy of Lights Parade. The mile-long parade features Santa himself, along with marching bands, bright lights, giant balloons, equestrian units, and festive floats. The event is free to watch but if you prefer VIP seating, tickets are $20 and include a Santa hat and a digital download as a souvenir of the parade. For a panoramic view of Gatlinburg sparkling with Christmas lights, consider a visit to Ober Gatlinburg and a ride on the Scenic Chairlift, or the 2.1-mile ride from downtown to the ski area aboard the country’s largest Aerial Tramway. After you reach the top, extend your holiday fun with indoor ice skating, snow tubing, experiencing the Alpine Slide, or zipping along on the Ski Mountain Coaster. End your visit with a cup of hot chocolate, doing a little Christmas shopping at one of the shops or selecting something good to eat at one of the Ober restaurants. If Christmas lights are what you want to see this season, then don’t miss Winterfest in Pigeon Forge on your holiday itinerary. Experience the brilliance of over five million twinkling Christmas lights. Winterfest 2016 runs from November 8th through February 28th. You’ll find plenty of excitement with light displays along Parkway and shows, concerts, parties and celebrations around town all season long. Don’t forget Dollywood, ablaze with millions of its own lights this time of year, and presenting acclaimed shows, evening parades, and synchronized light shows in the Dollywood Smoky Mountain Christmas playlist. And for more Christmas merriment, up the road a few miles from Pigeon forge is Sevierville with its own dazzling lights that extend up the highway to the Interstate 40 as a Season’s Greeting to visitors. 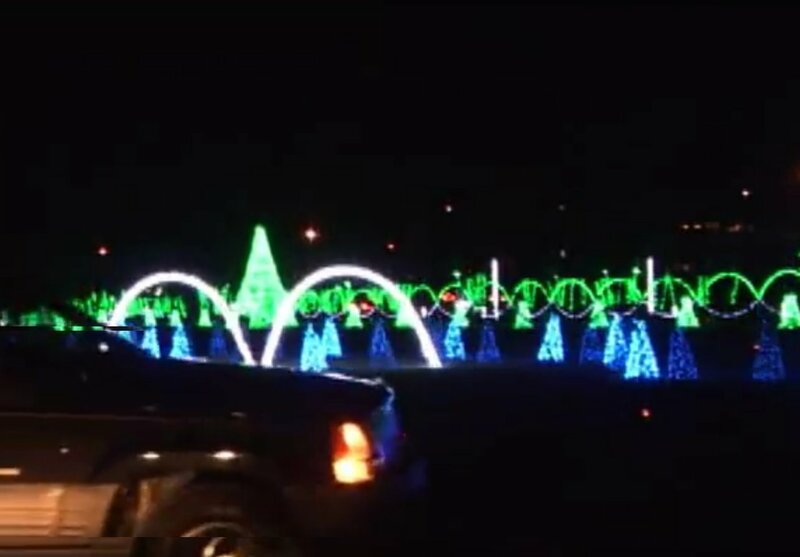 Keep driving to Shadrack’s Christmas Wonderland, and stay in the car for the unique experience of driving through a light show synchronized to music! Shadrack’s is open every night from November 4 through January 8, including Christmas. There’s room to park and stroll also with food and fun for kids. A few of the activities include seeing Santa’s Workshop, having a picture taken with Santa, taking a pony ride, visiting the petting zoo, feeding the animals, watching Christmas movies on the big screen, and stopping by one of the souvenir stations where kids can make their own crafts. Taste buds will be satisfied with tasty food and snack vendors on hand. Make this year’s destination jolly with a visit to Gatlinburg and Pigeon Forge where the sights and lights of Christmas will be shining bright throughout the holiday season. Also see our main pages for Gatlinburg Cabins and Pigeon Forge Cabins for rent. And check our tips for Finding the Best Cabin in the Smoky Mountains as well as Getting the Best Value for your cabin.